Home › Nutrition & Wellness › What’s Inside That Nut? Nuts are a great way for you to increase the nutrient density of your diet and improve your heart health in one crunchy bite. Nutrient density is measured by the amount of vitamins and minerals contained in a food or beverage per calorie consumed. The 2010 Dietary Guidelines suggests we Americans need to swap out our high calorie, nutrient poor choices with selection that are more nutrient dense. 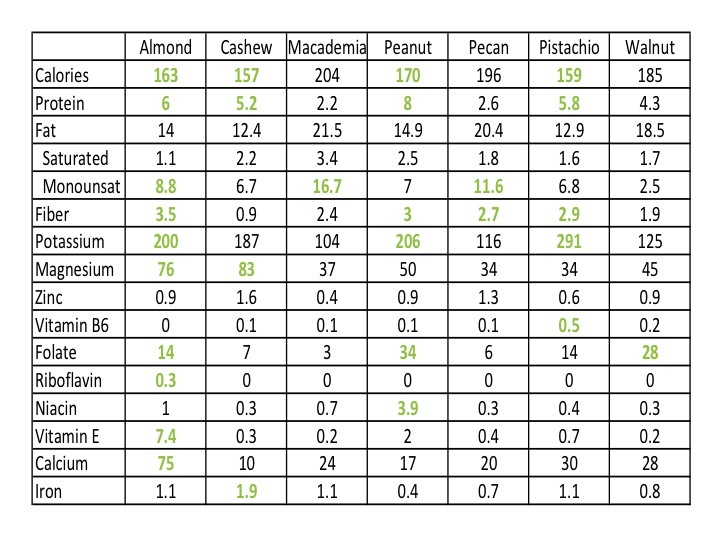 Check out the chart below to see what vitamins and minerals are in your favorite nut. All servings are based on one-ounce portions. In 2003, the United States Food & Drug Administration approved this package label “Qualified Health Claim” for nuts. What makes nuts so special? Nuts are rich in both monounsaturated and polyunsaturated fats which can help reduce bad cholesterol levels in your blood and lower your risk of heart disease and stroke when consumed in place of the unhealthy saturated or trans fats. While nuts contain higher amounts of the poly and monounsaturated fats, they still contain nine calories per gram of fat. Calories can quickly out trump their benefits if you are mindlessly eating them out of the jar or can. One ounce is equal to 1/4 measuring cup, a shot glass full, a 3×3 post it pad or a small fistful. Healthy Tip: I recommend a single serving of nuts as a healthy snack mid afternoon. They help take the edge off hunger going into the dinner hour so you are less apt to munch during dinner preparation or overeat when the meal is finally served. ‹ 150 Minutes of What?